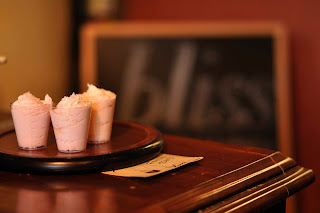 Today is the Grand Opening for a fantastic little bakery in the Old Market - called Bliss. Our friends - Luke and Autumn Pruitt are the owners. It is a great little place with some amazing things to eat. These are frosting shots. Personally - I could not do these things. But some of you - and you know who you are - Tammy Gillett - would love these. Go check out Bliss - 11th and Jones.